Appellant has a right under the First Amendment to appeal in public. No. He doesn’t. His right to a public trial and, by extension, a public appeal is not secured under the First Amendment. IANAL, but the last time I checked the Bill of Rights, due process rights are secured by the Fifth Amendment. Patrick Frey’s due process rights are also protected by the Fifth Amendment. His lawyers were able to convince a federal judge that certain information given to The Dread Pro-Se Kimberlin during discovery in the RICO Remnant LOLsuit should have been sealed in order to protect Frey’s rights (and possibly the rights of third parties). TDPK repeatedly asked the District Court to unseal that information, and he was never able to provide a reason why Patterico’s rights should not have been protected. TDPK’s motion to unseal is timestamped as being received by the Fourth Circuit Court of Appeals at 10:06 Monday morning. The order denying his motion was docketed at 12:01:59 Tuesday afternoon. It didn’t take the court long to see through his frivolous argument. The Dread Pro-Se Kimberlin did file a sealed version of an informal opening brief in his appeal of the Kimberlin v. Frey RICO Remnant LOLsuit, and he filed a motion with the Fourth Circuit Court of Appeals to unseal his brief. However, the court’s instructions required that he also file a redacted version for the public docket, and he failed to do so. He’s been given one week to fix his mistake. The court has also denied his motion to unseal the sealed version of his brief. The Dread Pro-Se Kimberlin’s informal opening brief for his appeal of the Kimberlin v. Frey RICO Remnant LOLsuit was due at the Fourth Circuit Court of Appeals yesterday. As of 9:02:57 pm Monday night, nothing had been posted on the case docket on PACER since 29 September. Now, it’s possible that TDPK got his paperwork in on time but too late in the day for the Clerk’s Office to have scanned and posted it online. If he did get it submitted, it should show up on the docket tomorrow. We’ll see. Meanwhile, here’s the TKPOTD from three years ago today. It deals with the original RICO Madness LOLsuit. The Kimberlin v. Frey RICO Remnant LOLsuit is the last surviving count of the original RICO Madness case. The Gentle Reader who has been following The Saga of the Dread Pirate Pro-Se Kimberlin for a while will remember that TDPK’s state nuisance lawsuit collapsed when he failed to provide even one “scintilla” (Judge Johnson’s word) of evidence of falsity in any statement made by any defendant in that case. TDPK has tried to make a similar allegation in the RICO Madness. Since defamation is a state law claim, TDPK has to prove the elements of the tort as prescribed by Maryland law. That means he must show what was said about him was false. He can’t do that. That’s already been adjudicated in the state case in the favor of Aaron Walker, Stacy McCain, Ali Akbar, and me, and he is barred by collateral estoppel arguing otherwise in any further case, including the RICO Madness. I’ve made it clear that I intend to keep writing about Brett Kimberlin until he is brought to justice. The Gentle Reader should not be surprised to learn that part of my definition of his being brought to justice includes his losing his vexatious lawsuits. By delaying the final resolution of any of them, he increases the amount of time and bandwidth I will spend on telling his story on the Internet. His delaying tactics have the effect of turing the Streisand Effect up to eleven. 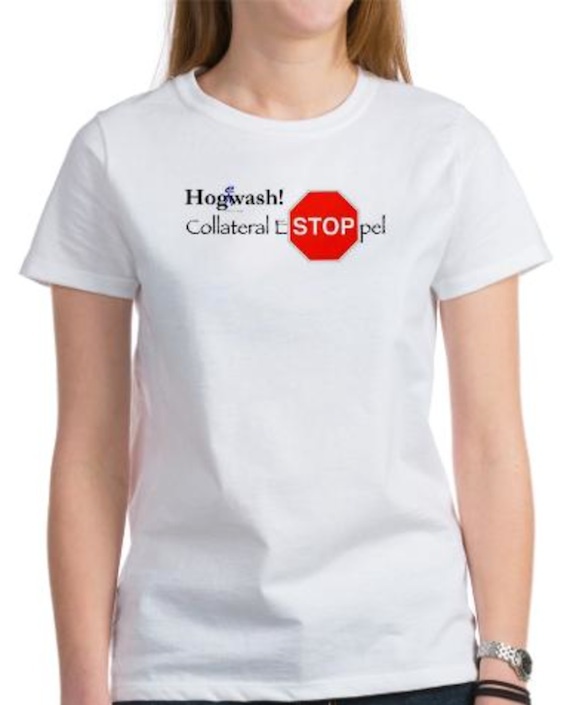 Oh, one more thing … Collateral Estoppel swag is available for purchase at The Hogewash Store. Stop by a spend some money on a t-shirt or drinkware. The profits go to support this blog and fund the expenses of defending against TDPK’s vexatious lawsuits. If you’d like to help my fellow defendants as well, go to Bomber Sues Bloggers to find out how. Of course, we’re no longer taking donations through Bomber Sues Blogger now that Kimberlin’s lawfare has failed so miserably. The RICO Madness LOLsuit was dismissed, the follow up RICO Retread state LOLsuit was dismissed also, and dismissal of the state case was affirmed on appeal. The Fourth Circuit Court of Appeals has given The Dread Pro-Se Kimberlin until close of business tomorrow to file his informal opening brief in the appeal of the Kimberlin v. Frey RICO Remnant LOLsuit, so we should be seeing something on PACER by tomorrow or early Tuesday at the latest—unless Kimberlin has decided to give up on the appeal and let it be dismissed for lack of prosecution. Nah, he’s not that smart. I’ll bet he’ll file something. I also be that it will be as incompetently drafted as the rest of the stuff he’s filed, his opposition to the motions to dismiss in the Kimberlin v. Team Themis, et al. RICO 2: Electric Boogaloo LOLsuit, for example. He filed it two years ago today, and I published a copy as More RICO 2: Electric Boogaloo that very day. The Dread Pro-Se Kimberlin has filed what he calls his omnibus opposition to the motions to dismiss his Kimberlin v. Team Themis, et al. RICO 2: Electric Boogaloo LOLsuit. This also includes an untimely opposition to my motion to dismiss for failure to state a claim and does not properly address my motion to dismiss for lack of subject matter jurisdiction. My name only appears in a few places in the LOLsuit’s complaint, but it appears over 60 times in the opposition to the motion to dismiss. The increase was caused by Kimberlin’s failure to properly [redacted—I don’t intend to educate the midget, even at this late date] in the complaint and his attempt to improperly [redacted] in his opposition. Kimberlin LOLsuit was dismissed by the U. S. District Court. The Fourth Circuit Court of Appeals denied his appeal and sanction him for frivolously including me as an appellee. Grumble. We’re still waiting for news in pending Team-Kimberlin-Related court cases. Four years ago today, I posted this Statement on Fund Raising related to the first Kimberlin LOLsuit, Kimberlin v. Walker, et al. Brett Kimberlin is suing a group of bloggers that includes me for a million bucks because we have published truthful information and constitutionally-protected statements of opinion about him. Aaron Walker, one of the bloggers named in the suit, is a lawyer, and he is being sued for offering legal advice to Kimberlin’s victims. Gentle Reader, can you think of any rights more important than your First Amendment right to free speech or your Sixth Amendment right to legal counsel? Kimberlin and his cronies have been engaging in lawfare for years now, and it’s time to put a stop to it. We need to defeat his bogus lawsuit because, if we don’t, there will be no end to his harassment of others. You can help us. Go to BomberSuesBloggers to learn how. [We won the LOLsuit back in 2014, so we’re no longer raising money to fund our defense.] If you decide to donate to the defense fund, you should know that I will never see one cent of the money raised. The proceeds will go to paying the substantial costs of defending the suit. Yes, I am represented by a pro bono lawyer, but there will still be filing fees, deposition costs, etc. 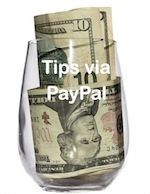 If you want to support this blog directly, hit my Tip Jar or use the Amazon shopping link on the Home page. UPDATE—Stacy McCain points out that if we don’t defeat this suit, it’s possible that Kimberlin might sue you. As if to prove Stacy’s point about Kimberlin’s eagerness to engage in lawfare, The Dread Pro-Se Kimberlin filed his Kimberlin v. The Universe, et al. RICO Madness LOLsuit the next day after my post was published.